WhoIsConnectedSniffer is a network discovery tool that listens to network packets on your network adapter using a capture driver (WinpCap or MS network monitor) and accumulates a list of computer and devices currently connected to your network. WhoIsConnectedSniffer uses various protocols to detect the computers connected to your network, including ARP, UDP, DHCP, mDNS, and Browser. After collecting the connected computers/devices information, you can easily export the list to tab-delimited/comma-delimited/xml/html file. 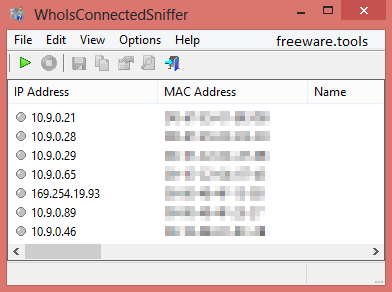 WhoIsConnectedSniffer is a lightweight and efficient application whose main purpose is to monitor your network in order to detect the IPs and MAC addresses of the computers and devices connected to it. Not to be confused with a network scanner – WhoIsConnectedSniffer simply listens to the packets that are being sent throughout the network, followed by a quick analysis and a full report related to the detected connections. In order to be able to simulate a packet listener, if we may call it that, the application requires a capture driver, such as WinpCap or Microsoft Network Monitor that can help it sniff the traffic actively. Making use of a variety of protocols (ARP, DHCP, UDP, mDNS, and BROWSER) to achieve its purpose, WhoIsConnectedSniffer automatically detects the capture driver(s) installed on your computer, allowing you to choose the one to be used throughout the monitoring process. For Microsoft Network Monitor, it even lends a hand in monitoring WiFi connections if you’re tied to such a network. You will also have the possibility to select the adapter to use for the sniffing process. As soon as you initiate the capturing operation, WhoIsConnectedSniffer immediately engages in achieving its task, displaying all of the computers and devices that are currently connected to your network. The report includes details such as IP and MAC address, computer / device name, description, operating system, network adapter producer, detection count, identified protocols, as well as the date it was first and last detected on. These chunks of information can be exported locally to a text file or a HTML report, which you can make use of at a later time for further analysis. All in all, the amount of details that WhoIsConnectedSniffer delivers on network devices is quite rich, therefore network administrators can make the most of it. Considering its ease of use, it can also be an asset for home users.